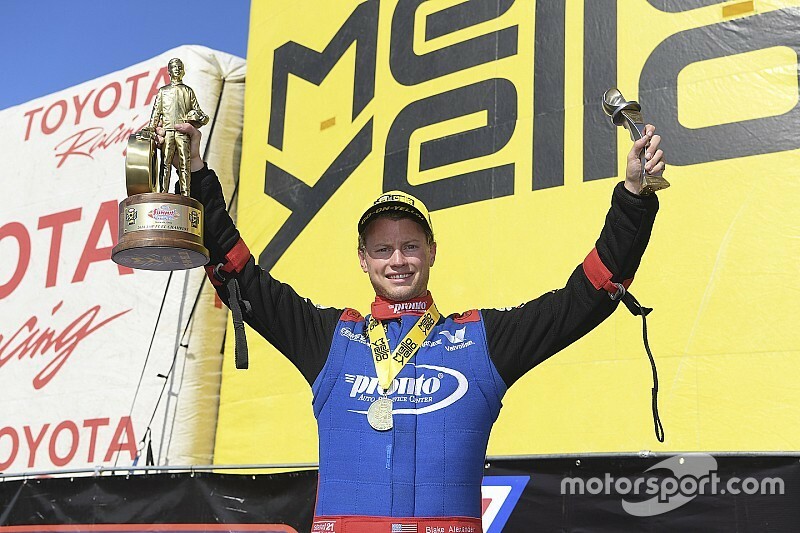 Blake Alexander powered to the winner’s circle with a run of 4.004-seconds at 287.41 mph in his Pronto Auto Service Center dragster to take down the most successful driver in Top Fuel history, Tony Schumacher, in the finals. Despite having competed at only six of the 15 events held this season, Alexander now has three final round appearances of which he’s won two. Alexander took down Mike Salinas, three-time world champion Antron Brown and Scott Palmer while Schumacher’s third runner-up finish of the season helped vault him into second in the points standings behind leader Steve Torrence. 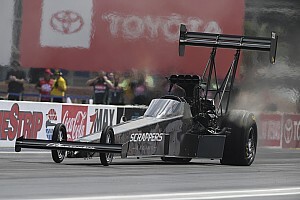 Schumacher was also one of four Top Fuel competitors to join Torrence by clinching a position in the Countdown to the Championship playoffs, as he, Clay Millican, Doug Kalitta and Leah Pritchett fill out the five of the 10 available Top Fuel spots in NHRA’s six-race postseason championship clash. The defending Funny Car champion Robert Hight used a 3.984 at 319.75 in his Auto Club of Southern California Chevrolet Camaro SS to beat Ron Capps in the final round, securing his second win of the season and his second at Sonoma. 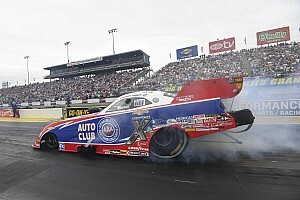 Capps, too, is now guaranteed a playoff berth, along with teammate Matt Hagan and Hight’s teammate Courtney Force. Jeg Coughlin Jr. drove to a 6.532 at 212.16 in his JEGS.com/Elite Performance Chevrolet Camaro to defeat Deric Kramer in the final round as he became the second driver in the Pro Stock class with three victories on the year. 2010 PSM champion LE Tonglet brought home the win with a 6.771sec pass at 198.52 on his Nitro Fish Racing Suzuki to take down points leader Andrew Hines in the final round. The 2010 world champion notched his third consecutive victory at Sonoma Raceway and he now has two wins on the season. Hines now has four runner-up finishes on the season and is currently at the top of the points table. He, along with Screamin’ Eagle teammate Eddie Krawiec, Tonglet, Hector Arana Jr. and Jerry Savoie are into the Countdown. Final: Robert Hight, Chevy Camaro, 3.984, 319.75 def. Ron Capps, Dodge Charger, 4.077, 296.11. Final: Jeg Coughlin, Chevy Camaro, 6.532, 212.16 def. Deric Kramer, Camaro, 6.534, 210.54. PRO STOCK MOTORCYCLE: 1. LE Tonglet; 2. Andrew Hines; 3. Eddie Krawiec; 4. Jim Underdahl; 5. Joey Gladstone; 6. Jerry Savoie; 7. Hector Arana Jr; 8. Matt Smith; 9. Hector Arana; 10. Steve Johnson; 11. Angie Smith; 12. Ryan Oehler; 13. Angelle Sampey; 14. Cory Reed; 15. Karen Stoffer; 16. Scotty Pollacheck. Final: LE Tonglet, Suzuki, 6.771, 198.52 def. Andrew Hines, Harley-Davidson, 6.802, 197.48.